After a number of years in which central banks were more concerned with fighting the risks of deflation, several signs point to a higher inflation environment in the US. Over the last 12 months, oil prices have shot up by almost 30%. The US economy is at “full” employment, with businesses reporting a shortage of skilled workers and an unemployment rate below 5%. Wage growth – initially sluggish – has also started to pick up in recent months, albeit without inducing major wage gains as yet. According to OECD estimates, growth should remain above potential this year with the usage of industrial production capacity currently running at close to 80%. At Lyxor, we believe such pressures in the productive apparatus will eventually translate into higher consumer prices. Some of these effects are already apparent. 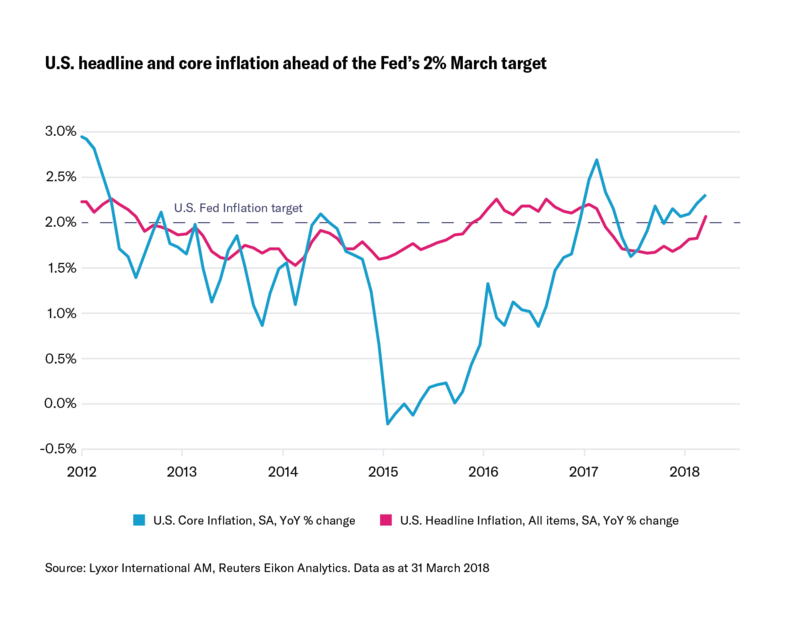 For the first time in almost a year, headline inflation (CPI) and core inflation (which excludes volatile components such as energy prices) printed above the Fed’s 2.0% target in March. 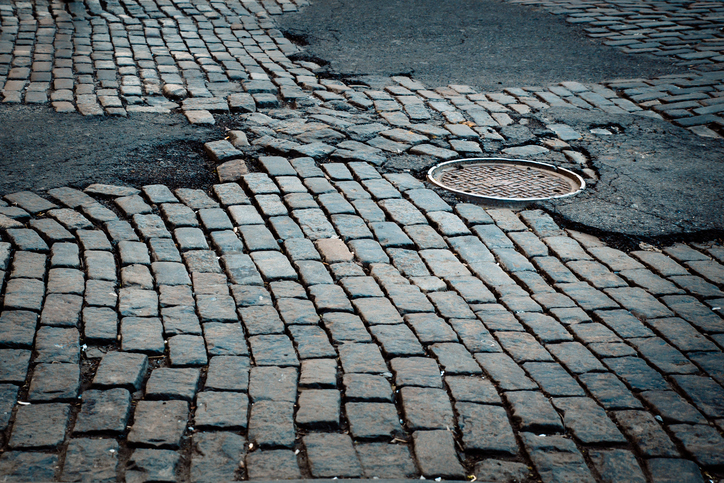 Higher inflation could well propel the push for higher speed policy normalisation. According to the March FOMC Minutes, Fed officials have grown more confident in the inflation outlook, barring the realisation of downside risks to their projections. 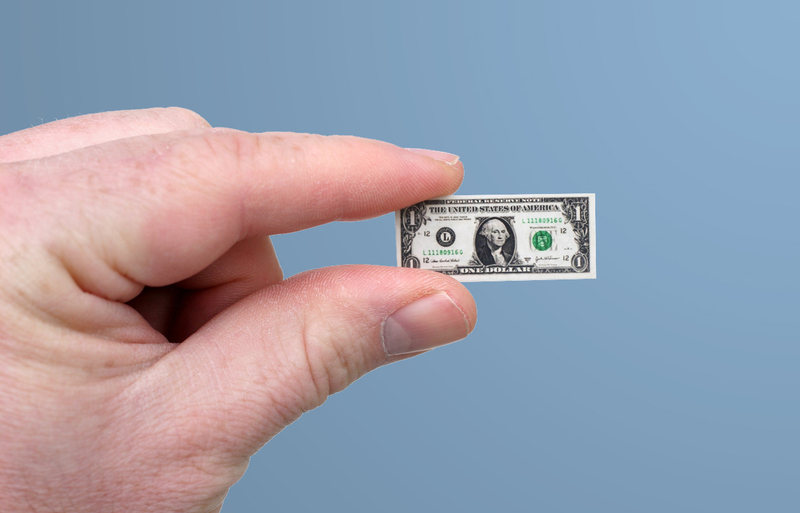 Strong inflation reports in March and April should keep the Fed on track for a 25 basis points rate hike in June – and enable it to deliver four in total this year. However, we do not believe that the inflation rate will ramp up too dramatically in the period ahead. Technological developments in areas such as healthcare or communications, unconventional petroleum production and greater investment in productive capacities are factors that could counter at least some of the inflationary pressures. Despite the relatively benign nature of the above, investors are increasingly concerned by other issues. Asset allocation has become more complex given greater political risk (like the possible trade war between the US and China), less support from central banks, and the high valuations most traditional asset classes are displaying. As a result, we expect to see a volatility regime shift, with markets much more volatile than they have been in recent years. 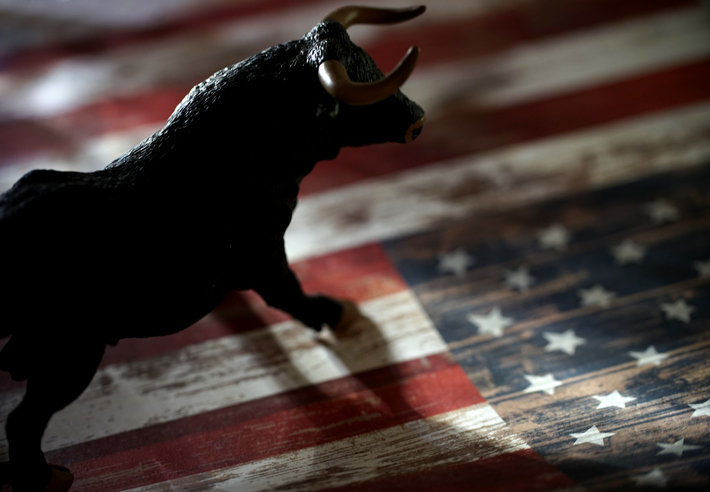 Some of the market moves we’ve seen in February and March were, in our view, the precursors for this period of instability. The positive correlation between the returns of fixed income and equity assets also impedes efforts to diversify portfolios more effectively. Historically, investors who adopt more cautious positions tend to reduce their exposure to equities and increase their weighting to fixed income. That may not, however, be wise in a rising inflation environment where greater caution is required on conventional bonds. Inflation-linked bonds may be better suited to this new normal. Our research shows assets related to inflation tend to perform well in the more advanced stages of the economic cycle. The expansion in the US is undoubtedly entering old age – so the probability of a recession in the next two years is increasing. Holding commodities, most notably petroleum products, tends to prove beneficial in advanced stages of the cycle (especially 12 months before a recession), both in terms of absolute and risk-adjusted returns. The analysis takes into account US economic cycles, as measured by the National Bureau of Economic Research, since 1970. Inflation breakevens have also been fairly well supported by the recent move in energy/oil prices (Brent crude was above $72/bbl on 17 April). Meanwhile, net flows into short-dated TIPS ETFs have been fairly robust over the past month (despite net outflows in March from all-maturities ETFs). While energy price moves are difficult to predict in the near-term, the possibility of weather-related or geopolitically induced spike in oil prices remains. They should nonetheless continue to underpin higher inflation expectations. Actual inflation prints, on the other hand, will continue to benefit from positive base effects (temporary slowdown in telecommunications and airfares in 2017) ahead of the summer. For now, we are looking to overweight assets such as TIPs and inflation breakevens, as well as commodities and those equity sectors that are most sensitive to inflation expectations. 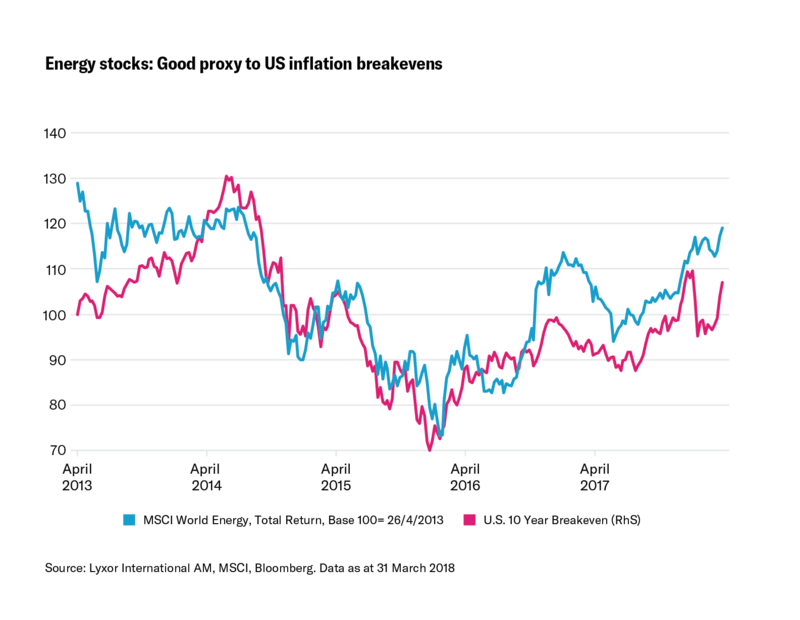 In equities, energy stocks offer a good proxy to oil prices and US inflation breakevens. 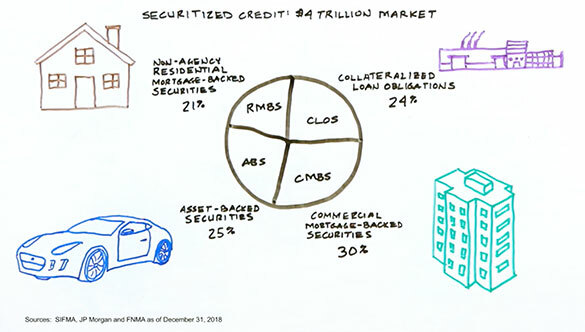 The global energy sector offers an attractive dividend yield of around 3.75% (i.e. positive carry) vs. the negative carry of investing in futures-based strategies. The latter underperform when the futures curve is in contango (futures price above the expected spot price) – which is typically the case with oil. Financials also remain a pure cheap way to play global reflation. Lyxor has the most far reaching and complete range of inflation-linked ETFs in Europe, with exposures covering the US, Europe, and UK. Our Core US TIPS ETF is the cheapest on the market at just 0.09%. If you’re looking to not only protect yourself against rising inflation but also rising rates, our unique inflation expectations ETFs are designed to tackle both. With over 12 years’ experience managing inflation-related ETFs, and €3.3bn in AUM, look no further for dependable solutions to rising inflation. *Source: Lyxor International Asset Management. Data as at 31/01/2018. Statements refer to European ETF market. Efficiency data is based on the efficiency indicator created by Lyxor’s research department in 2013. It examines 3 components of performance: tracking error, liquidity and spread purchase/sale. Each peer group includes the relevant Lyxor ETF share-class and the 4 largest ETF share-classes issued by other providers, representing market-share of at least 5% on the relative index. ETF sizes are considered as an average of AUM levels observed over the relevant time period. Detailed methodology may be found in the paper ‘Measuring Performance of Exchange Traded Funds’ by Marlène Hassine and Thierry Roncalli. Statements refer to European ETF market. Past performance is no guide to future returns. All opinions/data sourced from Lyxor & SG Cross Asset Research teams. Opinions expressed are as at 05 January 2018.